Two people have been arrested by Belgian authorities on suspicion of plotting terrorist attacks in “emblematic places” in Brussels on New Year’s Eve, Belgium’s federal prosecutor said on Tuesday 12/29/2015.. The police anti-terrorist raid took place in Brussels, eastern Liège province and in Flemish-speaking Brabant, central Belgium, on Sunday and Monday. Six people were detained during the operation. Four were later released. Two of the suspects were arrested. According to prosecutors, they did not have a direct connection with the Paris attacks, on 11/13/2015, that killed 130 people. According to prosecutors, police found military clothing and Islamic State propaganda material during the search of suspects’ homes. However, no weapons or explosives were found. “Our investigation revealed serious threats of an attack on symbolic places in Brussels during the celebrations for New Year’s Eve,” Belgian prosecutors said in a statement. Earlier, the Dutch-language Nieuwsblad newspaper reported that police fear that the attacks might take place near Grand Place, the central square of Brussels. which attracts scores of tourists every day. Police in Brussels have arrested 6 more people in connection with an alleged plot to target the city on New Year’s Eve, prosecutors said on Thursday 12/31/2015. 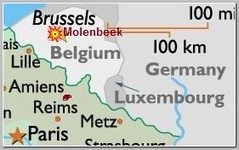 The arrests in Brussels were made during raids in suburbs including Molenbeek, which was used as a base by the Paris attackers. The arrests come as cities around the world heighten security measures ahead of large-scale New Year celebrations. The city’s main fireworks display has been cancelled over the feared plot. None of the six people arrested on Thursday has been identified.